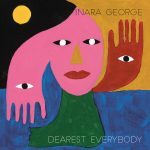 Glide Magazine has an interview with Inara George, whose Dearest Everybody is at radio along with her duet with Charlie Wadhams. George explains that the album is made of “songs that I wrote for friends, for special people, and sort of as a gift mostly; for people who had lost someone or as kind of a tribute to the person who had been lost. It sounds sort of dark but I think of the record as kind of light; not light like fluffy but a record that has deep emotions but is supposed to be uplifting.” The interview doesn’t just stop with Dearest Everybody, however, as it dives deep into her career with the bird and the bee, her childhood love of Prince, and her recent guest appearance on a Foo Fighters record.